Nightfall, Sept 21, 1999: A team of rescuers from Singapore, working closely with local rescue officers and volunteers, begin their search for survivors in Nantou City, Taiwan, following a massive 7.6 magnitude earthquake. The first foreign rescue team to arrive in the quake-ravaged city that saw more than 100,000 buildings damaged or destroyed, the unit is just 45 minutes into their search for survivors when one of their rescue dogs barks and sits in front of a collapsed room – signalling that it has detected some sign of life. The rescuers carefully shift blocks of concrete away – and find a boy among the rubble. Moments after moving the young survivor to safety, an aftershock causes what’s left of the room to cave in. On Aug 3 this year, that unit was deployed for its 18th mission – to aid flood relief in Laos following the collapse of the Xe Pian-Xe Namnoy dam. They are rescue experts who will wade through torrents of flood water and sift through rubble – sometimes putting their own lives in peril – to save others. But just who are these unsung heroes we barely hear about? Meet the Singapore Civil Defence Force’s (SCDF) Lionheart contingent. Lionheart was formed in 1990 by the SCDF for the purpose of rendering humanitarian aid to our neighbouring countries in the Asia-Pacific region. Currently, the organisation maintains a 76-man round-the-clock standby contingent that consists of a Disaster Assistance and Rescue Team (DART), paramedics, and operations officers. They have been deployed to disaster areas in China, New Zealand, Thailand, Indonesia, Philippines, Taiwan, and Malaysia to aid in anything from earthquakes and tsunamis to forest and large building fires. The Lionheart contingent is the first unit of its kind in Asia to receive the Heavy Urban Search and Rescue (USAR) classification by the United Nations in 2013. According to the SCDF, their K9 Search unit had an integral role to play in achieving this international endorsement on the organisations search and rescue capability. Members of the elite rescue team must have the physical stamina and mental fortitude to endure extended rescue operations. An example of this would be one of Lionheart’s most memorable deployments – that 1999 rescue mission in Nantou City, Taichung County. They may have found their first survivor just 45 minutes into their operation, but their mission lasted an arduous 20 days. DART Captain Winston Chang and the rest of his team were the first to arrive and the last to leave the stricken city, even staying to share their knowledge with local emergency services through seminars. Lionheart operatives are trained in a myriad of situations. They are as adept at performing rescues in confined spaces as they are to saving someone trapped in a high-rise building. In 1993, the Operation Lionheart contingent was activated to search for survivors in the collapsed Highland Towers on the outskirts of Malaysia. Amidst the constant rain and a potential landslide that would’ve halted rescue efforts, Lionheart operatives rappelled down the heights of the collapsed building in slippery and unstable conditions, refusing to give up. 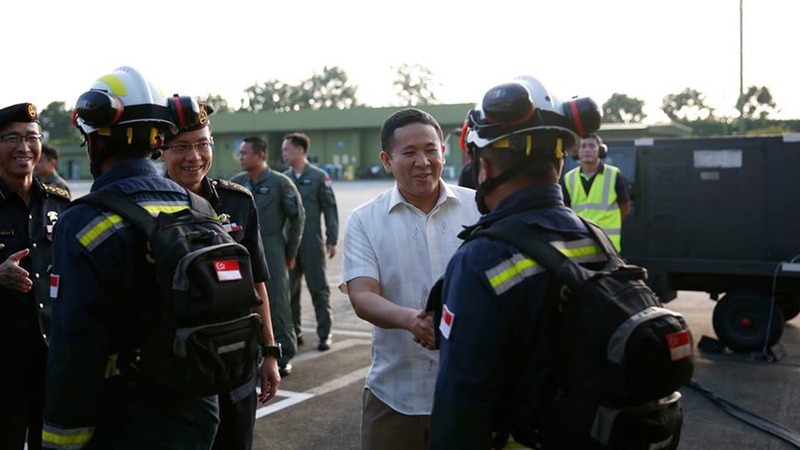 The unit’s tenacious efforts led to the rescue of three survivors, and the episode prompted Malaysia to form their own specialised rescue unit named SMART – the Special Malaysian Assistance and Rescue Team (SMART), which underwent advanced rescue training courses in Singapore. The Lionheart contingent consists mainly of DART members. The road to becoming a DART member starts from the fire station, where candidates usually spend three to five years in the service before either being recommended or choosing to specialise in DART. They are then put through a gruelling series of disaster and rescue simulations to test their physical and mental capabilities. One of the tests requires candidates to don about 20kg of gear while doing a full ladder and hose reel set up – which is what firemen do before attempting to put out a fire – and then lugging a 30kg dummy up and down three stories. Another test takes candidates into a smoke-filled maze where they have to look for clues on how they can survive. As the temperature rises, they are required to keep their cool while performing tasks such as disentangling ropes and searching for an exit. All these are meant to ensure that that the DART member is capable of operating in an actual disaster situation. The men of the Lionheart contingent are probably the best the SCDF has to offer. Their work may not be as glamorous or high-profile as, say, elite fighter pilots or commandos, but lives depend on what they do. Operation Lionheart has travelled to 10 countries across 18 missions, rescuing those in active disasters, recovering bodies, wading through flood, and braving fires. For that, we are proud of them. You can send a message to them here.